Monitoring blood sugar levels, carbohydrate intake, and medications are daily tasks for most diabetics. Keeping track of food intake and adhering to drug doses can be challenging to maintain on a day-to-day basis. 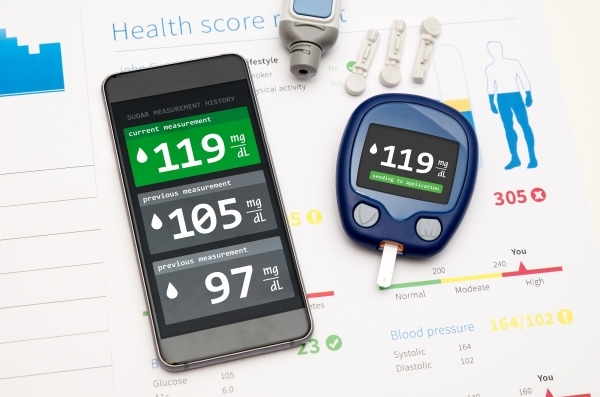 Fortunately, technology and medicine combine to support diabetic health! Applications or “Apps” are available for download on most electronic devices, helping organize valuable data like meals, blood sugar readings, medication times, and lots more! App technology allows for storing and easy accessibility of health information beneficial in the management of diabetes. WebMD comments on app technology stating, “Applications -- or "apps" -- can help you with nutrition advice, carb counting, tracking blood sugar levels, medication alerts and managing kids with diabetes.” Discover which apps best accommodate your lifestyle and health needs! 1. Diabetes Pal: Keeps a log of your medications, food intake, and blood sugar readings. This app allows note-taking and inputs data into a visual graph. 2. Glucose Buddy: Reminds you when to check your blood sugar. Also, records blood glucose levels, medication doses, nutritional intake, and exercise. 3. Charity Miles: Tracks your exercise and rewards selected charities for your hard work. Simply choose from a group of charities listed on the app and get moving! 4. Zombie – Run: A fun way to exercise as you listen to a zombie story. You can access exercise data, stats, and graphs on the application’s website. 5. GoMeals: For a colorful healthy plate download this app! GoMeals monitors daily nutrition, food data, and calories with over 40,000 common foods and 20,000 restaurant meals listed on the app. 6. MedSimple: Alerts you when prescription refills are needed and daily medication times. MedSimple keeps track of prescription and over-the counter medication doses and times, as well as prescriber and pharmacy information. 7. Sleep Time: Monitors different stages of sleep and amount of sleep each night. According to the ADA new studies support the correlation between sleep and diabetic health. Visit the ADA for more diabetic app suggestions.